The terms "Search Engine Optimization" and "keyword optimization" are staples in the digital marketing world. Inbound marketing agencies like ours have been using them as a driving force behind our marketing campaigns since pretty much the dawn of digital and inbound marketing. But you've probably been hearing things like "SEO is more than just keywords these days" and "search is transforming" as well as, "Google's algorithms are more sophisticated than ever." So, this begs the question, is the classic SEO optimization of keywords even working anymore? And if not, what are we going to do about it? Long gone are the days when you could throw a keyword in your title, meta description and 5-7 times throughout a blog post to make Google love it and rank you for it, and HubSpot knows it. Now, the algorithm is getting good at recognizing natural human thought and speech patterns, as well as what's good content and what's just trying to pull up a ranking for a certain phrase. And not only is Google better at reading your content (so make it good! ), but it's also scanning to see the authority of that post through the links coming to and from it. That's why marketers like us are getting pounded with emails asking about guest blogging right now, because Google likes posts with lots of link backs and authority built into it on similar topics. On top of that, not only is Google shifting how it's reading your content, but the way people are searching for content is different, so everything has to be optimized for voice searching. For example, once upon a time not so long ago, optimizing for "Grand Rapids, Michigan restaurants" may have been an ideal keyword, but today, "What are the best restaurants in Grand Rapids, Michigan?" is more in tune with what people are asking Siri to find for them. Keywords are now longer phrases and questions rather than just one or two words, so they need to be optimized accordingly. It's time to up your content strategies, folks. And that means building content that plays right into Google's algorithm-loving hands. Thankfully, HubSpot can help us to do that within the Content Strategy tool I was talking about earlier. The tool allows you to build out your content in a way that organizes it and measures it so Google ranks it higher, providing you with more of the right traffic to your site. Want to up your content strategy this year? We have a complimentary webinar that's available right now, "Tips for Getting Your Content Seen in 2018 ". Watch it here. 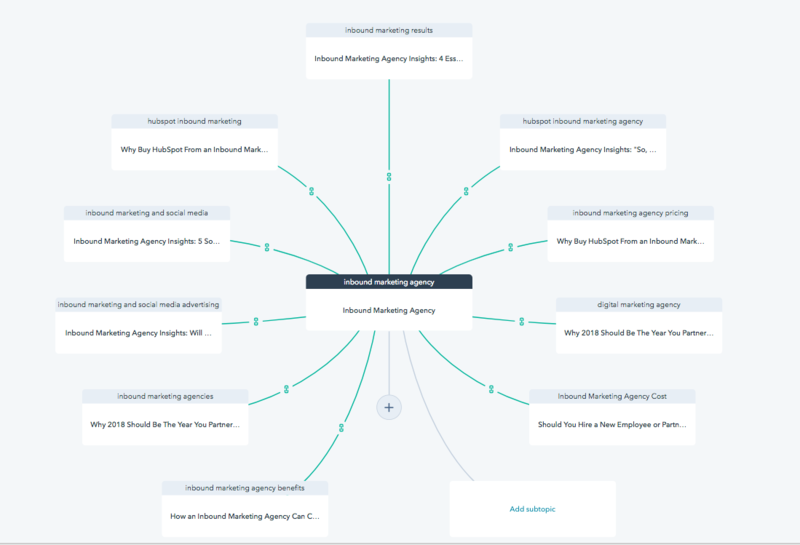 Your cluster starts with a primary topic in the middle which is the term or phrase you want to generate traffic from, and that's where you should link to what's known as the topic's pillar content. Pillar content is a well-written and in-depth content piece that your persona would find a great deal of value in. Lots of people ask us if these can be blogs and while that's possible, usually blogs are too short to serve as pillar posts because pillar content needs to have over 4,000 words. (Here's a link to an example of one of our pillar pages.) You then build the cluster out with supportive sub topics that are that link to the pillar page within their content. 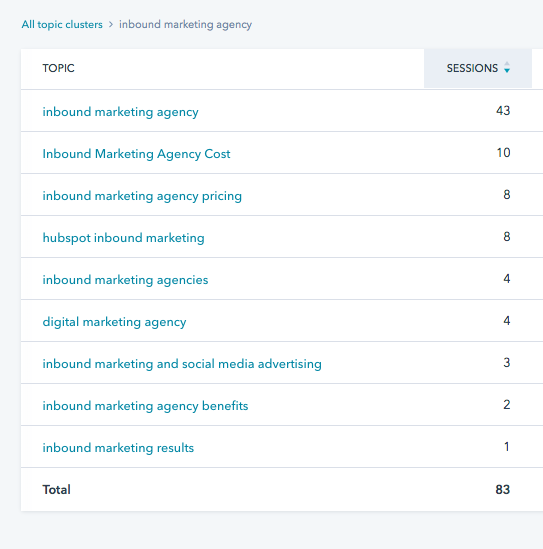 HubSpot will suggest topics for you, or you can add them manually if you identify more valuable topics to include. The best part? Once you build these lil' gems, you will now know when people come into your site off one of the links attached. Remember how the keyword tool would tell you "unknown keywords" as the source for almost all organic traffic you received? Once you have a content strategy web built out like the one above, the analytics will provide you with which topic or subtopic page was viewed from the search engine, so although you don't know EXACTLY what search terms the visitor typed in on Google, you now know that the page they clicked into was what they thought might answer their search query, which is powerful information to help generate more quality traffic to your site. We understand change can be hard - we've been feeling the pain of transition as well - but what we're learning so far is proving to be far more valuable than a simple SERPS rank number. The key is understanding the traffic coming into your site and making more strategic decisions based on what your searchers want from your website. Once we shift our thinking into that focus, we're going to be creating better content for our buyer personas that truly answers the questions they are looking for, leading them further down the buyer's journey and closer to becoming one of your customers.